Is it too much to claim that I make the best damn brownies, after I already claimed I also make the best damn small-batch sugar cookies? My brownies are simple cocoa-powder based babes with a touch of flour at the end. I use cocoa powder for absolute intensity of the chocolate, and a small amount of flour at the end for chew. The recipe has plenty of granulated sugar because that’s what makes the crackled surface on top, did you know? Unlike cake batters that you must gently fold together, I ask you to beat the heck out of the batter before spreading it in the pan. Roll your sleeves up, get in there, and activate that gluten in the flour! Fifty rough strokes! Gluten is what gives brownies their chew. It’s so worth it! If you’re new here, let me catch you up: I make small-batch desserts. I do that by using small bakeware most of the time (you can find it in my Store), but sometimes we get lucky and a regular 9″ bread loaf pan is perfect for us. 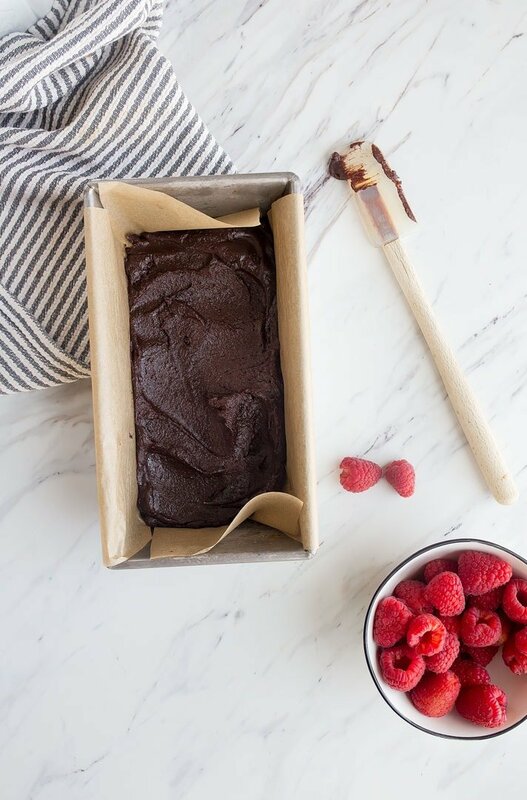 This brownie batter, when spread in a bread pan, makes 2 large brownies! Okay, fine, maybe it’s 4 reasonably sized brownies. But, personally, I had no trouble eating half. 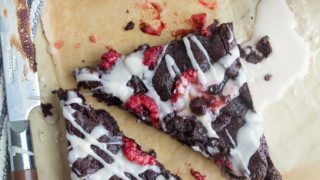 I added fresh raspberries to my standard Brownies for Two recipe, plus a Chambord glaze. I fell in love with the raspberry liqueur called Chambord after someone tipped it in my hot cocoa. If you want to replicate that lovely cup of cocoa, you should check out my Raspberry White Hot Cocoa with Chambord recipe! Just a tiny little thing I must say: if you’re serving these to kids, leave off the Chambord glaze, okay? The day I tested this recipe for you, I ended up making Camille some of my Small Batch Chocolate Chip Cookies so she would have something to nibble on when I denied her a boozy brownie. 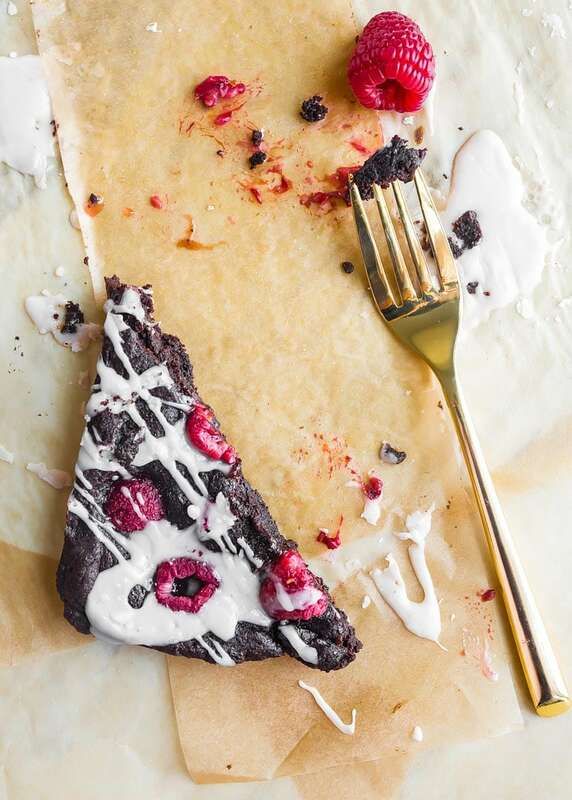 If you can promise me these raspberry brownies for two are just for you and your Valentine, then please, booze it up! 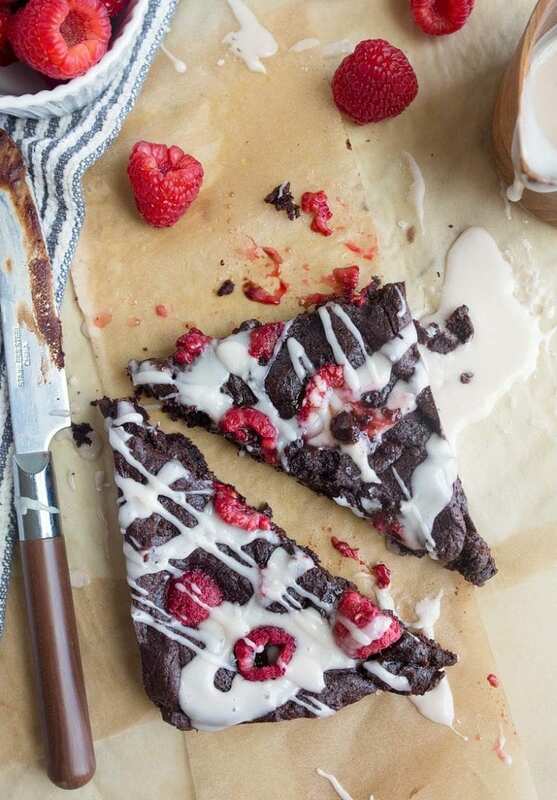 Raspberry Brownies for Two with Chambord Glaze. Line a 9-inch bread loaf pan with parchment paper in two directions, overlapping. Leave enough excess to make handles so it's easier to pull the brownies out once they're baked. When the mixture feels warm, not hot, stir in the vanilla, almond extract and salt. Finally, stir in the egg. Spread the batter into the prepared pan evenly. Sprinkle the raspberries on top, pressing some into the batter. While the brownies cool, whisk together the glaze in a small bowl. Add more Chambord as needed to make a smooth glaze. Drizzle the glaze over the brownies, cut into pieces, and serve. I was already fully on board and then I saw CHAMBORD GLAZE. I am now in dire need to make these. These look fantastic! 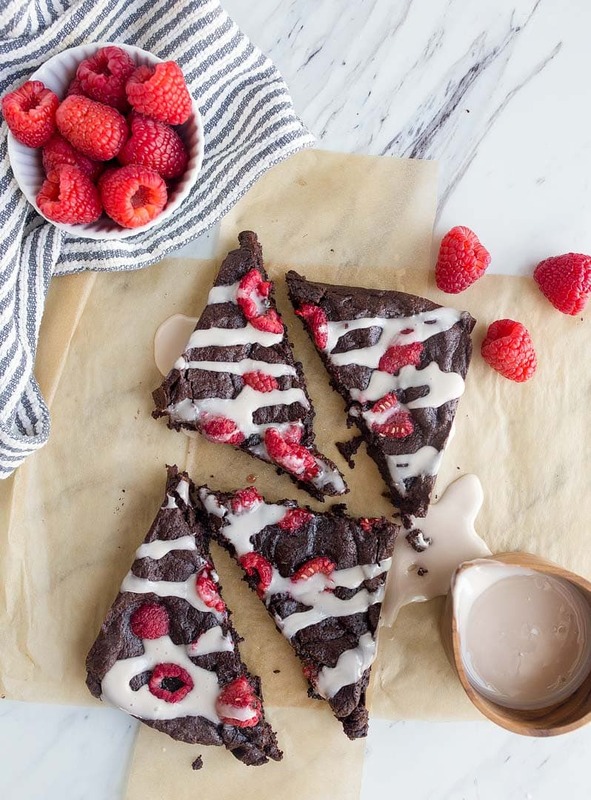 To clarify, do you bake the raspberries with the brownies or scatter on top after baking? Also, how is the Chambord glaze made? (I’m guessing with not much Chambord, as the glaze in the photos doesn’t look pink-tinged). Anyway, I refer to your 3 cookbooks more often than any others on my shelf. Thank you for the many delicious recipes! Yum! Thank you for sharing :) Where can I find the directions for the Chambord glaze? They look perfect! Raspberries are hard to find in New Delhi India. You can find them only imported and are very expensive. Do you think we can use strawberries instead? 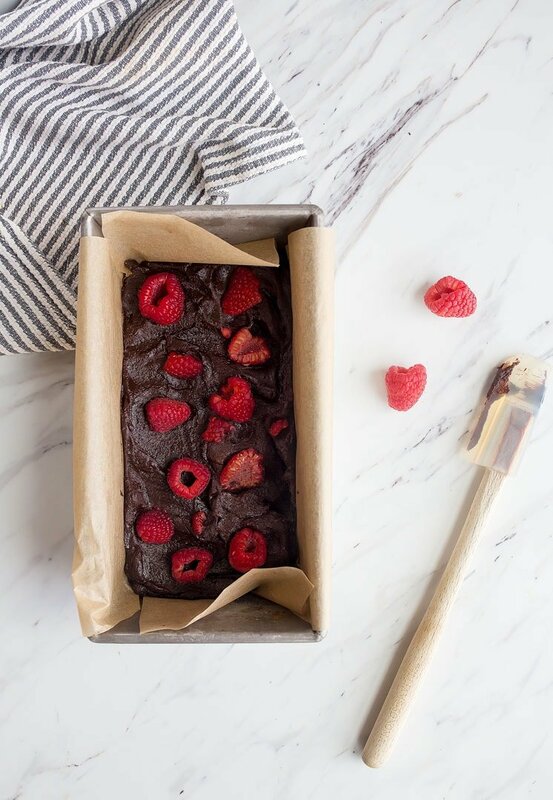 Let us know, because this looks like the ultimate brownie recipe we would love to try. I made these over the weekend and they are delicious! I didn’t have Chambord and didn’t feel like going to the liquor store, so I used a Raspberry Italian Syrup for the glaze. This is the perfect serving size. Thanks so much, Christina, for creating this recipe! It’s so easy, too! Christina Lane, you’ve ruined me. Now I have the ability to make small batch brownies whenever I’m craving them. This is dangerous on so many levels! I added a touch of espresso powder because I only had raw cacao instead of cocoa and I swapped the vanilla and almond extract for more Chambord. 🤤 Thank you for this recipe. Keep ’em coming!